Democratic voters are less likely to go online and to be online political users than Republicans, but the Democrats who engage in the online political process do so more intensely than their GOP counterparts. Despite the great success Democrats had in using the internet this election cycle, Republicans as a whole (68%) are actually more likely to be online political users than Democrats (53%) or Independents (56%). This is largely a function of partisan differences among internet users as a whole: 84% of Republicans go online compared with 71% of Democrats. Republicans are more likely to be socio-economically upscale, which is also the case with internet users. And groups with relatively low rates of internet usage such as African-Americans and low-income voters tend to vote disproportionately Democratic. Among internet users, 79% of Republicans and 73% of Democrats are online political users, a much smaller difference than is present in the population as a whole (although still statistically significant). Moreover, because there are currently more Democrats than Republicans in the overall population, Democratic voters actually make up a slightly larger percentage of the online political user population—Democrats comprise 36% of the overall population and 34% of online political users, while Republicans comprise 25% of the population and 30% of online political users. These partisan differences are less pronounced when comparing McCain voters with Obama voters, rather than Republicans with Democrats. 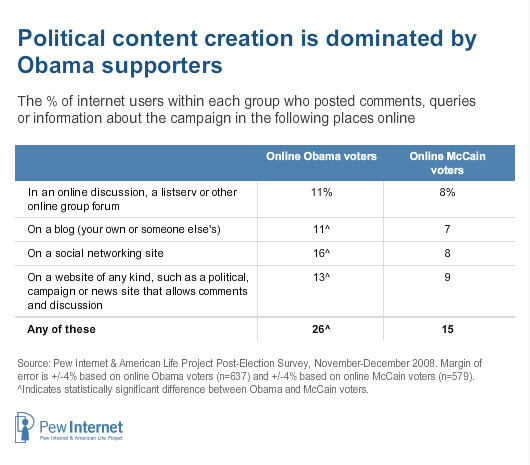 Among all voters, 68% of McCain supporters and 61% of Obama supporters are online political users. However, online political engagement among wired supporters of each candidate is nearly identical—80% of online Obama voters and 81% of online McCain supporters are online political users. This divergence between party analysis and voting analysis appears to arise at least partially from the fact that the independent voters who go online were more likely to vote for Obama/Biden ticket in the fall, while those who do not go online were relatively more likely to vote for the McCain/Palin ticket. Within the cohort of online political users, Democrats and Obama voters tend to engage in a wider range of activities than Republicans or McCain voters. Among online political users fully 50% of Democrats do all three of the above activities compared with 40% of Republicans. 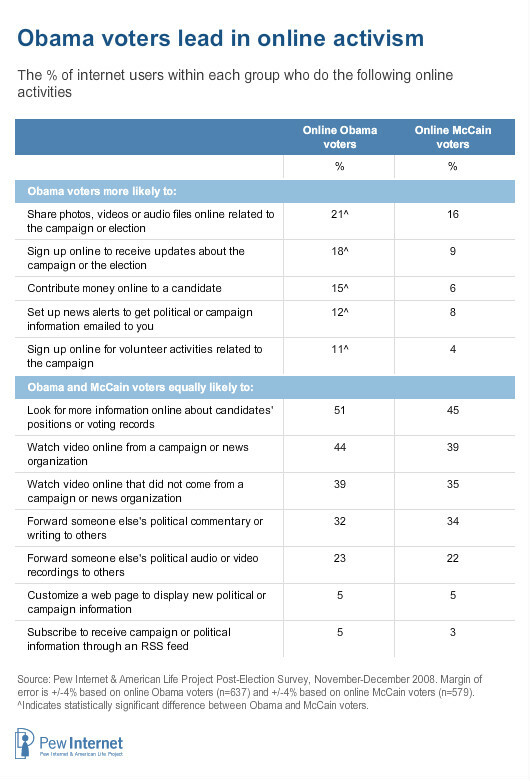 Similarly, 48% of Obama voters who get engaged politically online do all three kinds of online political activities, compared with 41% of McCain supporters. 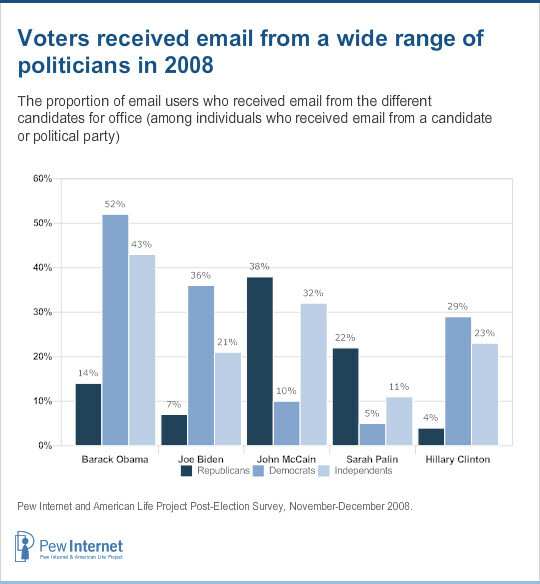 48% of Obama voters who use email received email from a campaign or political party this election season, compared with 38% of email-using McCain voters. Among those who use cell phone text messaging, 17% of Obama supporters and 7% of McCain supporters got text messages directly from a candidate or party. Also among text messaging users, 49% of Obama voters shared text messages related to the campaign with others; 29% of McCain voters did so. Supporters of the two campaigns were equally likely to communicate about politics using instant messaging. The small number of Twitter users in our sample showed a tilt towards Obama, but the number of respondents was too small to make meaningful partisan comparisons on this topic. 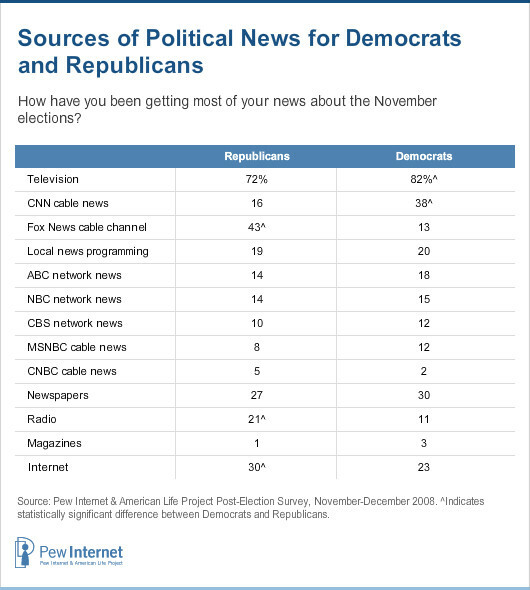 With respect to their sources for political news, Democrats are somewhat more likely to rely on television news, while Republicans are somewhat more likely to rely on the internet and radio. Partisans of all stripes tend to watch similar television news content, with two major exceptions. CNN is particularly popular with Democrats and independents (38% of Democrats, 31% of independents and 16% of Republicans cite CNN as a major source of television news), while Fox News Channel is most popular with Republicans (43% of Republicans, 27% of independents and 13% of Democrats watch Fox News). Obama voters are out in front on a host of online political activities. Among internet users, Obama voters outpaced McCain supporters in their use of the internet to customize political content, to share campaign news with others and to facilitate their participation in campaign activities such as volunteering and donating money. Wired Obama voters were nearly twice as likely to sign up online for election alerts (18% did this, compared with 9% of online McCain supporters), to contribute money online (15% vs. 6%) and to sign up for campaign-related volunteer activities online (11% vs. 4%). Obama voters also took the lead in setting up custom political news alerts (12% vs. 8%) and in sharing multimedia content with others (21% vs. 16%). Obama voters also led the way in creating their own online political content. One-quarter (26%) of online Obama voters posted their thoughts about the election on a blog, listserv, social networking site or other website, compared with 15% of McCain supporters. However, Democrats and Obama supporters are more likely than Republicans and McCain voters to use social networking sites in the first place (41% of online Democrats and 33% of online Republicans do this, as do 44% of online Obama voters and 29% of online McCain voters), largely because young adults are disproportionately Obama supporters. As a result, Obama voters tend to be more politically active on social networking sites when viewed as a whole—25% of online Obama voters got involved politically on an online social network, compared with 16% of online McCain voters. Visits to both Democratic and Republican presidential campaign websites were up notably compared to 2004, and voters received email from numerous public officials over the course of the campaign. Compared with the previous presidential election, voters in 2008 showed significantly greater interest in visiting the websites of the two major candidates for office. Fully 30% of all internet users visited the Obama/Biden campaign website (up from the 18% of wired adults who visited the Kerry/Edwards website in 2004) and 21% of internet users visited the McCain/Palin site (compared with the 14% who visited the Bush/Cheney site in the previous election cycle). Nearly half (45%) of online Obama voters and one-third (32%) of online McCain voters visited the website of their “team” for news or information during the campaign. In addition to visiting the web presences of the respective candidates, voters also received a range of direct email communications from the different candidates in the race. As noted earlier, 37% of all email users got email messages from a candidate or campaign over the course of the election and those emails frequently contained the byline of the Democratic presidential ticket—among those who received political emails, 37% received messages signed by Barack Obama and 22% received messages signed by Joe Biden. By contrast, among this group 24% got email signed by John McCain and 12% got email signed by Sarah Palin. Indeed, emails from Hillary Clinton were nearly as common as those from the McCain/Palin ticket—one in five email users who received email from a candidate (19%) got a message from Hillary Clinton over the course of the campaign. A comparison of the candidate emails received by different partisan groups tells a similar story. Half of all Democrats who received email from a candidate (52%) over the course of the election received a message from Barack Obama, as did 43% of independents. Meanwhile on the Republican side, 38% of email-receiving GOP voters got an email signed by John McCain—put another way, nearly as many Democrats heard from Vice Presidential candidate Joe Biden (36% did so) as did GOP voters from the man at the head of their ticket.